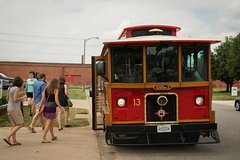 On this 4 hour wine tour, the trolley will stop at two vineyards, normally James River Cellars and Grayhaven Winery. Each vineyard has its own unique style, but both provide a fun and comfortable atmosphere to drink wine and relax with friends, family, or coworkers. This tour is regularly done on the weekends from 11am-3pm, based on interest and availability in a particular day, but we can also do a private wine tour with more flexibility with the date and timing if your group would prefer to have the trolley to yourselves! The price of each person's ticket will include the tastings at James River Cellars and at Grayhaven. Come with us to try some of the delicious wines that Virginia has to offer!